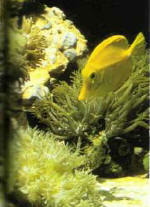 Tropical marine fish live in an environment lacking rocks but, on the other hand, abundant in corals and other elements that can be used to form the decor for an aquarium. Natural or artificial? In reality, this marine decor is a mixture of the two, colonized by invertebrates. Calcified coral skeletons can be used for decor. They are often rough or sharpedged and their stiffness depends on which species they belong to. They come in different shapes and sizes, and, with a few rare exceptions, are whitish in color. Bleaching them results in a perfect white. 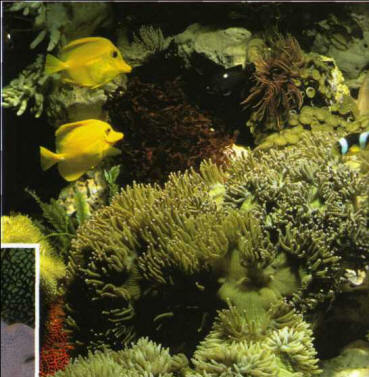 In aquariums, dead corals often gradually accumulate a covering of green algae. In this case, wash and brush them under running water and then soak them in bleach (1 sachet of bleach for 10 liters of water) for 1 week. This will not only whiten the skeleton but also destroy any organic particles that may have settled in it. Then rinse thoroughly and leave to dry in the open air for at least 8 days. 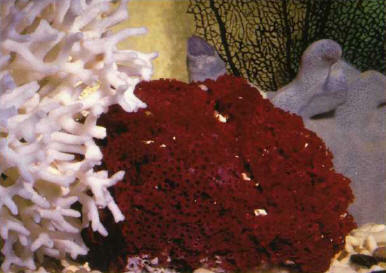 Do not apply this treatment to corals from the Tubipora genus with a colored skeleton. These must be cleaned with a soft brush in hot water and dried as above. Coral skeletons are one of the classic elements of marine decor. Gorgons produce a dark skeleton that often gradually decays and even ends up crumbling. They must only be treated with hot water, never with bleach. It is also possible to use the shells of mollusks (clams for example). Brush and wash them in hot water before putting them into the aquarium. Some aquarists consider shells as potential traps for accumulated waste products, but they can also provide a refuge for small fish and, in the same way, crustaceans. Live rocks can also play an important role in the decor of an aquarium. СМОЛЫ ПРИРОДНЫЕ , вырабатываемые некоторыми растениями сложные по химическому составу вещества; затвердевают на воздухе, растворимы в органических растворителях, нерастворимы в воде. Образуются главным образом тропическими растениями (копайский бальзам, шеллак и др. ); в умеренной зоне - преимущественно растениями семейства сосновых (канифоль). Ископаемые природной смолы - копал, янтарь. Применение природной смолы в производстве лаков, политур, клеев и др. сокращается в связи с их заменой синтетическими продуктами.